Generally Singaporeans are fortunate to enjoy sports stadium where the public could use the stadium for free. Today, to my great disgust, there was animal pooh on the wood-chips track at the Gombak stadium. The wood-chips track is specially designed for those athletes to exercise while recovering from injuries. Unfortunately some users not only bring their animals to accompany them at the stadium but abused by allowing their animals pooh along the track! Shame on whoever this person…! Whoever had done that obviously did not care about the worker responsible in maintaining the stadium! If there were complaints, who got the firing line? The worker! I believe many young budding athletes do not know facilities available. They do not take pride to care for the facilities available to them. They expect the sports councils to hire staff worker to take care of the facilities. Musicians take care of their instruments yet…athletes take for granted or do not?! On occasions especially during school holidays, I found children playing on the long-jump sandpit…these children would intelligently use their hands to sweep the white sand into the drain while the mother exercised away nearby! Today’s athletes or olympic silver medalists awarded $750K! 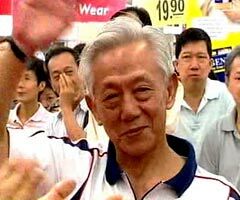 Tan Howe Liang, olympic silver medalist in 1960, was given a $10K by NTUC Income today but he was not rewarded at the time. Then, Singapore was not a rich nation… Considering the first olympic medalist, there must be some form of commendation. How I wish Tan Howe Liang is officially rewarded for his achievement yesteryear! Wishing there is some form of recognition comparable to those who won today! The achievements accomplished by many athletes were beyond expectation…what contrasting backgrounds the two ‘icon’ athletes who broke the world record. Usain Bolt, 21, 6ft 5in tall, track event, hails from Jamaica…an island in Caribbean Sea with a population of 2.7! Michael Phelps, 23, 6ft 3in tall, swimmer who won 8 golds comes from the US where the continent has topped the medals’ list at almost every Olympic Games since…? The US got the overall medal tally (110 medals) while China (100 medals) won the most gold medals (51). It appears the US athletes were consistent in the Games by achieving silver and bronze while China athletes were less consistent in performance. Were the Chinese athletes too tense to achieve their best? I enjoy the gymnastics exhibition performance last evening. The Chinese performers who won gold at the Games were so natural on their equipments — they were more relaxed, confident, strong, agile and flexible. The two Japanese gymnasts on synchronised gymnastics on the trampoline were stupendous. Naturally the Russian rhythmic gymnasts were exceptional. The lavish closing ceremony of the Olympics ‘one world, one dream’ theme ended with a bang…from drum beats, folk to popular music! The Olympic flag was handed over to the next host London — their 3rd experience in hosting the Games. The mayor of London quipped outside the ceremony, “pingpong is coming home!” Ha ha…what does that mean? Is this good humor? Is it unpatriotic to switch nationality to participate in the Olympic Games a dream many young cherished when they were found to have talents in the field of athletics? Take for instance, the table-tennis paddlers, Li Jiawei, Wang Yuegu and Tang Tianwei who clinched the silver medal for Singapore — if they had remained in their country of birth, they might never have the chance to participate at the Olympics and much less winning a medal. China had trained many young in sports and athletics and she has contributed much in this area. Will China reconsider training many of these sportspersons and athletes to one day lose them? Personally I hope not. China and Russia are the two nations that nationally trained their athletes…which have become their nation’s pride yet placing a huge pressure on the individual athlete. I wish their athletes are able to enjoy the talents endowed…rather than competing for competing sake and for national pride. “It’s a dream that a little boy from Kenya has dreamt about and finally came true, and it didn’t happen by myself. Becky Hammon chose and represented Russia when she failed to make the US women basketball squad for the Olympics. What does Olympic Games stand for? Talent in the area of athletics and sports…and a fulfilment of dream of the young. Jamaica is an island (area 4244 sq mi or 10,991 sq km) in Carribean Sea. She received independence in 1962 and has a population of 2.8 million. Literacy rate is 79%. Yet the Jamaicans both men and women won gold medals in track events at this Beijing Olympics. Usain Bolt is the fastest runner in the world at 22 years old. So in this sense, Jamaica top the medal table considering the size of population and land area! Jamaica has set the example for smaller nations…the gold medals are within reach for aspiring citizens. #176 china gymnasts falsify age? I heard on BBC that China’s gymnasts who won gold were under age. Was there deliberate oversight in submitting the age on their part? There is always confusion for those outside of China to know the age of the China Chinese. Even for one who is born in Singapore, growing up, I was always confused about my age until I applied for my national identity card when I was twelve. If you asked me what year my parents were born or their birthday, I couldn’t tell you. You see the Chinese go by their Chinese calendar year. I was befuddled with the age of some of my China-born friends living in China or those who never went abroad. Many of them don’t give you the actual date of their birthday…so when celebrating their birthdays, the day changes with our calendar year. This is NOT INCONSISTENT as the Chinese go by their Chinese calendar year. For unknown reason, the Chinese always add 2 years to the day they were born. Is this being dishonest? A lie? A stripping of the medals? Surely not…when this is cultural difference in interpreting age or the day they were born. That capture my heart are not just the medal winners but that put a smile on my face and lift my spirit. “I played very well today and I’m very satified. I demonstrated everything I learned in the training, so I give myself 90 points (out of 100),” the 19-year-old said, her eyes twinkling with joy. Sadly the American track and field teams were not able to win a medal: men had won since 1924 and women, 1948. Unfortunately both men’s and women’s relay team dropped the baton! The Jamaicans dominated these events. Tyson Gay, one of the fastest and best athlete, admitted without excuse he disappointed the team when he dropped the baton at the men’s relay –it was just one of those days. I admire Tyson Gay for his graciousness and he IS indeed one great athlete in the world!